PLUSCO 005 Dry Moly Lubricant Aerosol Spray is designed to provide effective lubrication, reduce friction, and improve overall operating performance such as, cleaner application, dirt and foreign particles will not adhere to product thus providing better lubrication and less wear on parts, will not wipe off easily (chemically attracted to metals), permits immediate use of chain or gear after application, will not run-off the parts to which it is applied (requires less frequent lubrications), and can be used at higher temperatures and will not carbonize. Withstands temperatures of -40°F to 600°F and extreme pressures, as well as water and chemical attack. 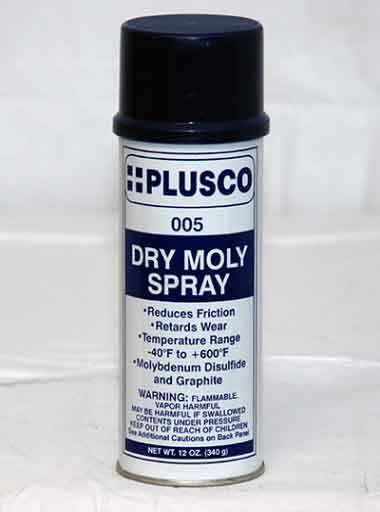 PLUSCO 005 Dry Moly Lubricant Aerosol Spray is a convenient film Lubricant to apply and ready to use in minutes. This compound is a non-oily, non-sticky, and will not cold flow, run, or drip. PLUSCO 005 Dry Moly Lubricant Aerosol Spray is recommended for use on chain and sprocket lubrication, reduction of sliding friction, lathe bed and rails, door locks and hinges, machine shops, and release agent.